We run through our days—going from appointment to appointment, responsibility to responsibility, activity to activity. Harried and hurried, we disconnect with family, friends, and God. From the moment of creation, God's intention was that we would stop on a regular basis for rest and renewal. God also made us to yearn for relationships and community. 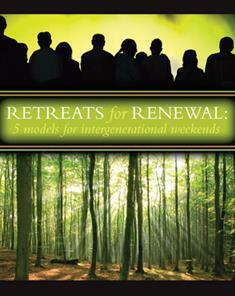 Hosting a weekend intergenerational retreat encourages sabbath time and deepens relationships within the whole congregation. It will offer a chance for all people of all ages to praise God, find a shared story, learn about one another, and discover the things that bind us together in Christ. "By carving out a sabbath time, all participants will be able to pause in the midst of their busy lives to rest and to pay attention to their relationships with God and with one another," writes Ferguson. "A sense of being part of a community of God's people will emerge and will continue to affect the lives of all who retreated. The faith of each person and of the community as a whole will be enriched." Find great ideas to help your congregation connect with one another.